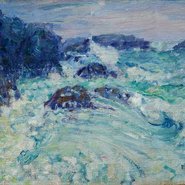 Art After Hours delves into the world of Australia’s French impressionist John Russell. Hear from the people who have been intrigued and inspired by him and visited Belle Île, Russell’s home in Brittany for over 20 years. For writer Sarah Turnbull, author of Almost French, the Australian artist John Russell has become a passion. Hear about her personal discovery of Russell 20 years ago whilst she was living in France and her feeling of connection with him. From Belle Île where Sarah met the locals and discovered what Russell meant to them; to Paris, the city which was once her home; and to an absinthe salon in Surry Hills, follow this international journey to find a notion of home. Catherine Hunter has had a long career covering the visual arts on Australian television. She was the arts producer on the Nine Network’s Sunday program for over 20 years. Since then, she has worked as a freelance director and producer and her most recent production, Glenn Murcutt: spirit of place, has been selected for film festivals all over the world. Catherine’s next film, on John Russell, will be screened later this year. Catch this talk about the film and the places she visited to create it. Catherine Hunter will be in conversation with ABC presenter James Valentine. Artists Euan Macleod and Luke Sciberras took a pilgrimage to Belle Île following in the footsteps of John Russell and many other artists. The works they created on this trip are the subject of the current exhibition at Manly Art Gallery. Tonight, they are joined in conversation by the curator of the John Russell exhibition, Wayne Tunnicliffe, to tell us about their trip, its inspiration and their friendship.